While Indy was in town this past week, we really wanted to treat her to a nice dinner, welcoming her in true foodie style, to the area. It just so happens that while we were at Disneyland last September, she treated everyone to a tasting menu at the Chef’s Counter of Napa Rose…complete with wine pairings. It still ranks up there as one of the most amazing meals I have ever had the opportunity to eat. Disneyland’s chefs work really well around my dietary needs, and my meal was completely gluten-free and vegetarian…complete with the perfect wine to compliment each dish we were served. Well, this gave us an idea…to treat her to a tasting menu at one of our local restaurant’s chef’s tables. It happens that three local restaurants have a chef’s table. And after a little debate…Cathy and I decided on a new hotspot in town, Rye. 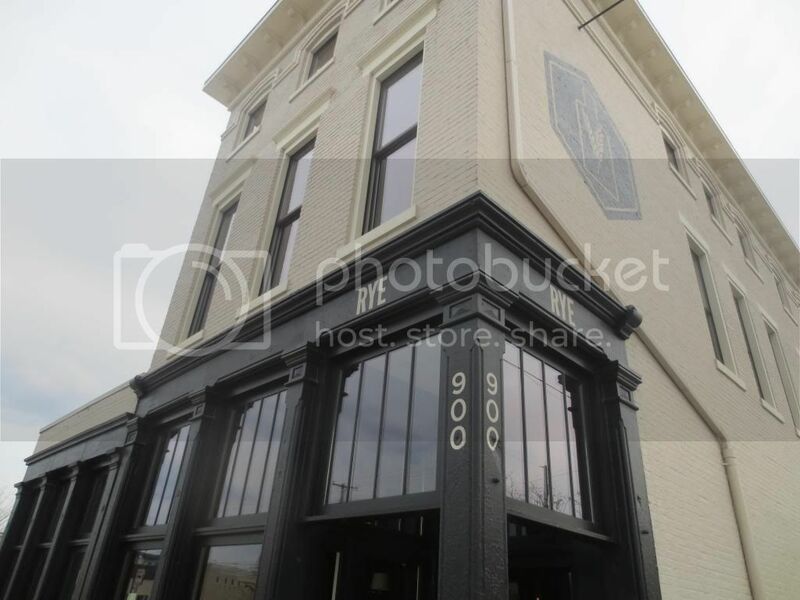 Rye is located in the NULU region of Louisville…and it seemed right up our alley. Cathy got in touch with the restaurant, speaking with PR and Events Coordinator, Erin MacDonaold, and made arrangements, explaining my dietary needs and that she and Indy would be up for anything. But they had to stay within the perimeters of my diet for me. The chef and the restaurant had no problem with that, so…it was set. 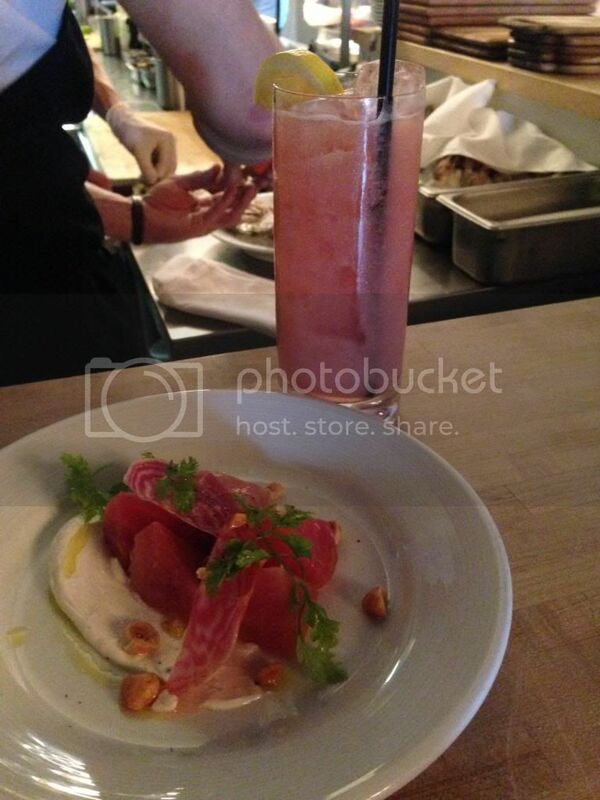 Friday night…we’d be treating Indy to a tasting menu with drink pairings at Rye. The most difficult part was not telling Indy we were doing this. The only instruction we gave her was to bring something nice to eat dinner out in on Friday night. That was it. That was all she got. And we didn’t even give her the name of the restaurant until we were getting close to it, even though she asked because she wanted to look it up on Yelp. We have our ways. Anyway, once she knew which restaurant, she seemed pretty excited about that. The chef’s counter, however, remained a surprise until we got inside and Cathy let them know our reservation. As we were being walked back to the counter at the kitchen, Indy leaned in and said, “Did I hear chef’s counter.” HAHAHA!! Yes, my dearest foodie friend. Yes…you did! We were seated at the counter, facing into the kitchen, getting a first-hand view of the chefs at work. I was soaking this in, just watching how they worked together, talked, and even put together each dish. It was heaven to me. I still have a dream of being a chef. Maybe one day it will happen. But this…was a treat and I was enjoying it. At Rye, that evening, we were assigned to the caring hands of Chef Joe Banet, Bar Manager Doug Petry, and Alyssa, who was around for anything we might need or questions we might have. Let me tell you, this team was amazing. Doug had the drinks out to us just before the food was brought over by Chef Joe. And Alyssa made sure we had everything we needed, from fresh silverware to full glasses of water. It was incredible. And, within a few minutes of looking over our menu that Chef Joe prepared, he came over to introduce himself and explain that he would have our first course up in no time. Our first course…of what would be an 8 course tasting menu. The only difference between my menu and those of Indy and Cathy was that mine was strictly vegetarian, so I was served a cooked vegetable instead of the protein they received. 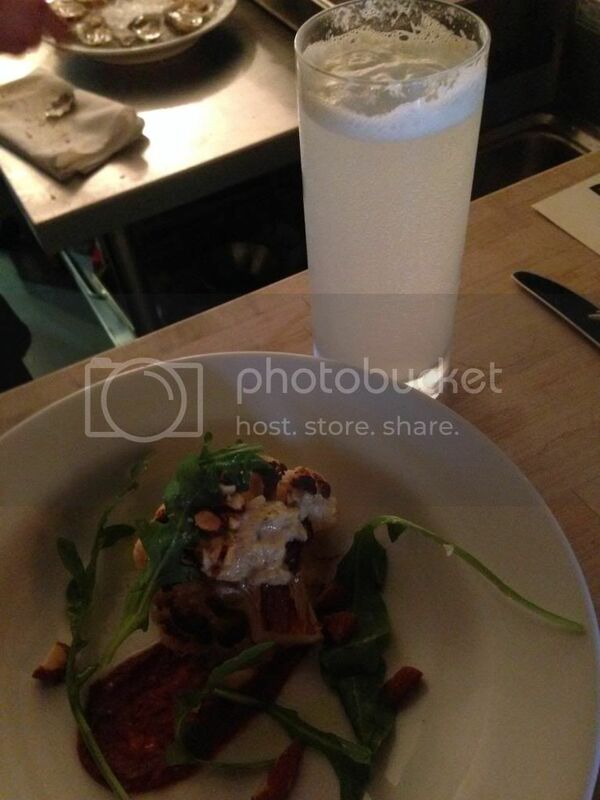 My drink was different in a few occasions too, better paired with my vegetable than their meat. Other than that…it was time to enjoy some good food and soak up the experience. And it was off to a good start. Doug brought out our first drink, a Dolin Blanc with Sugar and Meyer Lemon Bitters. 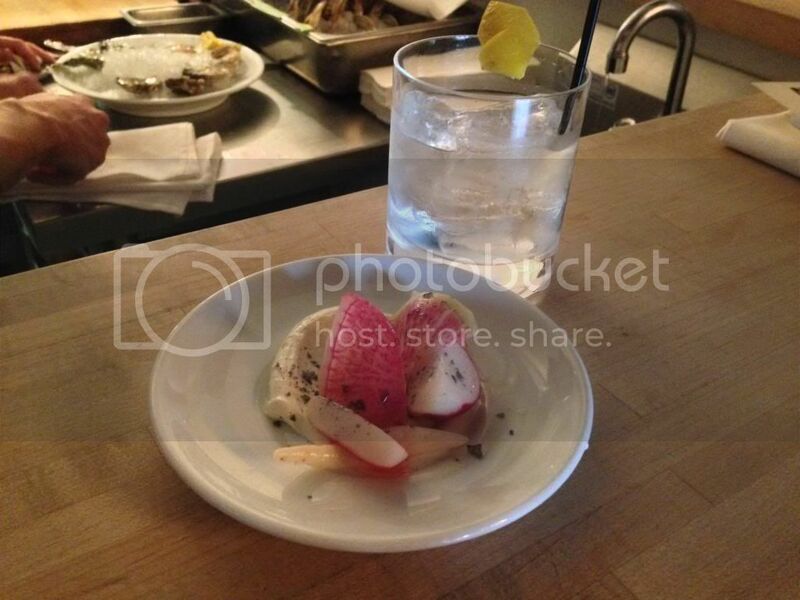 This accompanied our first course, which arrived a moment later…Radish with Whipped Butter. Granted, they had Caviar Butter with their Radish as well as a Potato Roll…but since I’m a gluten-free vegetarian…I received extra garnish on the radish with the whipped butter just beneath it with a hit of black salt. The radish was bitter, as it should be…and it was a bit odd being served with butter…especially since I had no way of really eating the butter. I put some on each bite of radish and it complimented the flavor well enough, the black salt cutting back on the bitterness by adding a little zing to each bite. Still a bit bizarre, but delicious. And that’s what mattered. The pairing with the Dolin Blanc was brilliant. The effervescence and lightness was a great way to start off the meal. Our plates were cleared and things were given time to settle. But, after about 10 minutes our next drink was brought out. It was a Strawberry Lemonade. No alcohol in this one. Just a sweet palate refresher. Not but a moment later, Chef Joe appeared with three identical plates. The second course was Beets with Lavender-Mango Chutney, Labne, Hazelnut and Chervil. THIS…my dear friends, turned out to be my favorite course of the entire meal. Yes…this one. 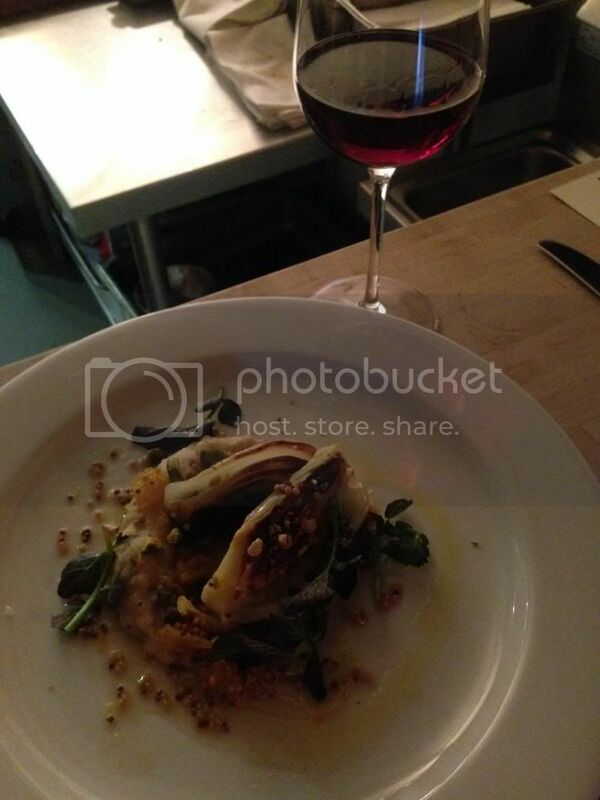 The roasted beets were fresh and fantastic. Perfect, really. And it paired so well with the labne (strained yogurt). The lavender-mango chutney was light and fresh. And topping it with toasted hazelnuts was a stroke of genius, as it gave a hit of texture when it was needed most. The fruitiness of the raspberry lemonade paired and played well with the sweet, yet earthy flavor of the beets. I was in foodie heaven with this one. I could have eaten another plate of that and been a happy girl. oysters they shuck per night, because there was a lot of shucking over on our end of the counter! ), observe some cooking techniques…and watch as the lights flickered and caused problems. The owner came over to apologize for the technical difficulties with the lights over the pass and asked if it was going to bother us as they fixed it because he could move us. We were content where we were, however. (On a completely different line of though, the phrase ‘where we were’ is kind of interesting to type!) Anyway, with that decision made, we were soon greeted by our third drink pairing prior to our entree. Cathy and Indy received a Stillwater Classique beer. This was a change from what was printed on the menu, so it took them by surprise. Since I’m gluten-free, my drink stayed true to the menu that was created, and I was served a glass of Chono Sauvignon Blanc. Cathy tasted her beer and didn’t like it much…but we still had food to pair with it. And Chef Joe appeared soon after, serving up our third course. 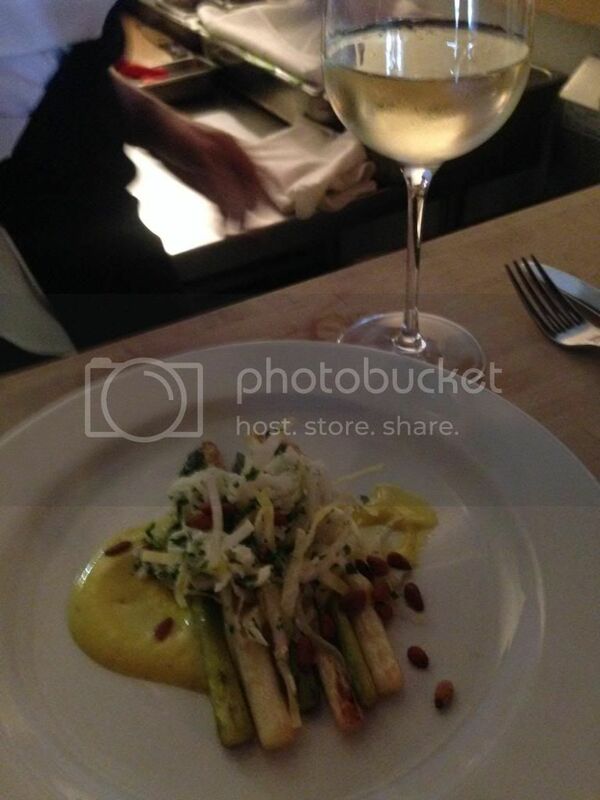 This course was Asparagus with a Smoked Egg, Endive, and Pignoli (pine nuts). First of all…a smoked egg is the most wonderful thing in the world. It’s smokey and savory and rich and creamy and just made of complete yumminess. Seriously…if I had a smoker I would do this every morning for breakfast. In fact, I asked Chef Joe how to smoke an egg…and now I kind of feel like I need a smoker just to be able to do it. Yes…this was a rich dish. The smoked egg was velvety smooth and paired so well with the bitterness of the endive and the perfectly cooked white and green asparagus. I savored each and every bite. And because it was so rich, the wine pairing was perfect. This course was comfort food to me. For the record, Cathy never did really like the beer. When plates were cleared, we all gazed down at our menus to see what was up next. This is where dishes started to really get different. Cathy and Indy were about to start getting their proteins. Mine stuck to a tried and true vegetable replacement for said protein. The rest of the dish would mirror each other. And, on some occasions…the drinks would be different. Such was the case for the fourth course of the night. This one was a light serving, which was what we needed after all the richness in the smoked egg and asparagus course. Doug brought over our drink pairings for the upcoming course. Cathy and Indy were given another beer, this time Stiegl Grapefruit Radler. Cathy was pretty certain she’d hate it since she hates grapefruit, but this turned out to be one of her favorite drinks of the night. Go figure. As for me, Doug paired mine with a Pineapple Blush, which he described in great detail and all I remember about it is that it had vinegar in it. That just seemed strange. But I gave it a sip prior to the dish coming up and it actually had a refreshing taste. The vinegar worked. Chef Joe brought over soup bowls for us. 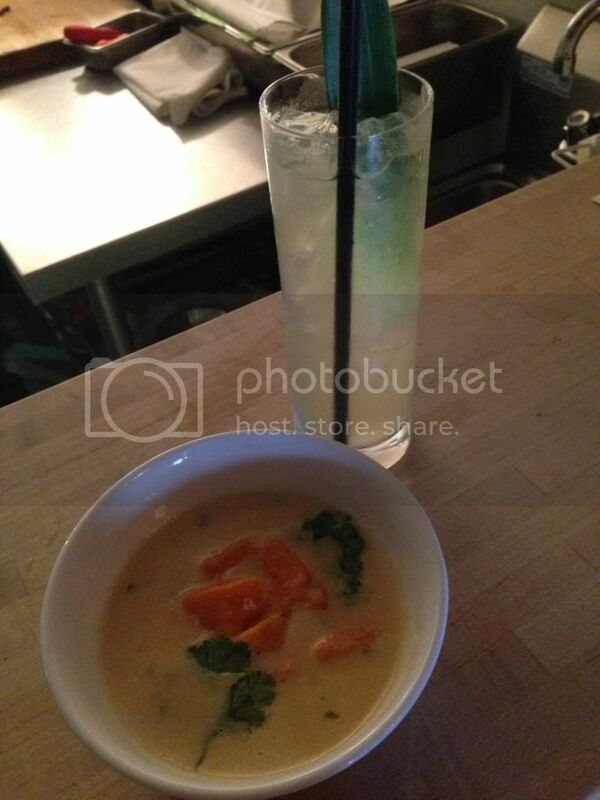 My soup was Sweet Potato in a broth made from Coconut Milk and flavored with Kaffir Lime Leaf and Cilantro. The broth was the same for Cathy and Indy, but they had Crab and Clam in their soup, not sweet potato. I loved how light this course was, and how refreshing. I am a sucker for soups as it is, and this one was perfection. Seriously. The broth was creamy without being filling. The sweet potatoes were soft and delicate and perfect. The seasoning was spot on. And who doesn’t love an amazing soup? Fantastic. And the drinks paired perfectly. I enjoyed sipping my Pineapple Blush between tastes of my soup. Delish. tables. It was so awesome watching the kitchen work while we ate. Doug returned with three glasses of identical drinks. We were each served one and he explained that we were about to taste a Gin that was done up with Lemon, Sugar and topped off with a Cucumber Sea Foam. I figured this one would be interesting because I’m not a big fan of gin…at all…but the cucumber sea foam sounded A-MAZ-ING! I took a sip, and while it did taste a little gin-y…the cucumber sea foam gave it this refreshing taste. I actually found myself liking this one. And, on cue, Chef Joe came over with our course. The fifth course of the night, for me, was a fantastically grilled Cauliflower with Harissa, Almond, Arugula and Cucumber. Ah…a match to that cucumber sea foam. Cathy and Indy were served Monkfish instead of the cauliflower. First of all, the harissa was amazing. This chili pepper paste was a nice play against the refreshing cucumber and the warm cauliflower. In fact, I was trying to get a little harissa in each bite because I loved how it worked with everything on the plate. The almonds added a nice hit of texture. Yeah…this one was so good. Now I want harissa in my kitchen to use on my own cauliflower when I cook it. Cathy fell in love with the monkfish, but Indy wasn’t as sold on it. Another plate clearing and more time to let things settle. We were starting to get full, but we were over the halfway point. And thankfully these were small plates. This time, our food beat the drink to our counter. So, Chef Joe went ahead and described our sixth course to us. For me, I was given Broccoli Rabe with Ramps, Hon-Shemeji Mushrooms, Yellow Grits, and Lovange. Cathy and Indy were served Rabbit with their ramps, mushrooms, grits and lovange. We waited for a moment and a minute later, Doug was at our sides giving us each a glass of Leese-Fitch Zinfandel. We now felt ready to dig in. I sipped the wine first, finding that bitterness that I often find with red wine. But it was good. 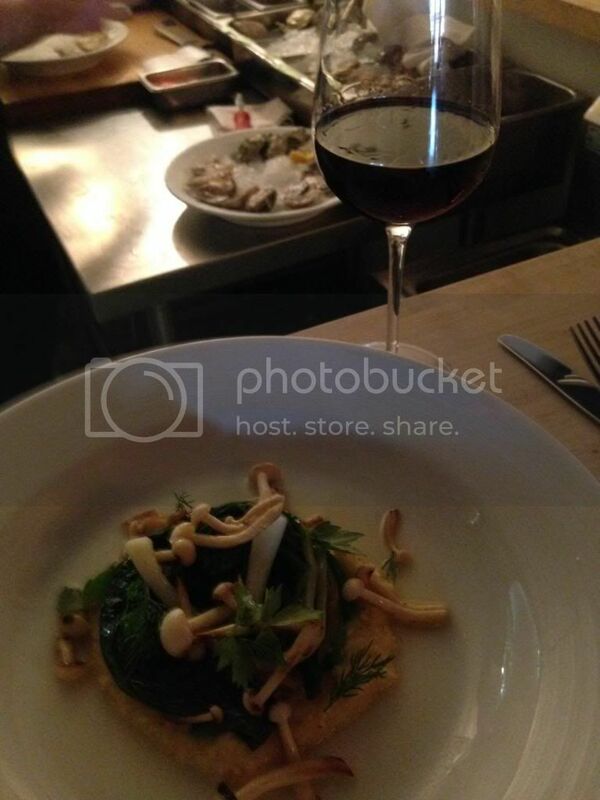 And when I took a bite of the broccoli rabe with the ramps (onions) and the earthy mushroom…it was a perfect pairing. My favorite part, however, was the grits. And as I lived in Alabama for six years and never liked grits, this totally surprised me. I couldn’t say enough good things about these grits. This was a fantastic course and we all polished it off. Indy much preferred the rabbit over the monkfish, saying that the cuter your food is, the better it tastes. Veggies must be really cute, because my food was really good. And so…our plates were cleared once more and we waited, talking about how the impending food wall was approaching. But we didn’t care. The food was some of the most amazing I had in a long time. This was definitely a treat. Doug appeared at our sides with a glass of Angeline Reserve Pinot Noir and talked about how it would pair well with our next course. Chef Joe arrived with our plates. I was given Fennel with Parsnip, Black Garlic, Red Watercress, Pistachio, and an Orange-Mustard Jus. Cathy and Indy had Duck instead of the fennel. Wow. I loved how the Fennel was grilled and cooked down to perfection. The parsnip puree was perfect. It wasn’t gritty at all. The black garlic paired well with everything, seasoning it perfectly. I loved how the pistachio gave it some texture. And, surprisingly, the orange-mustard jus was delicious and just amped up the flavor of the dish. Cathy and Indy definitely seemed happy with the duck. And when we were done eating, we were all eying the menu. One course to go…and it was dessert. I always have room for dessert. Gone were our dishes and Cathy was really, really looking forward to our dessert. Why? It was lemon. And we are both huge fans of anything lemon. Seriously. Even better, the chef changed the way it was made so we could all have the same dish and it could be kept gluten-free. This made me a happy, happy girl. Doug appeared with our final drink pairing of the night. This was a Gerard Bertrand Cremant de Limoux. I love dessert wines. LOVE. If I could drink dessert wine all the time, I would totally do it. Pure perfection. This was light and crisp and just…delicious. I had to remind myself to save some for the dessert. Chef Joe brought out the most amazing looking dessert of all time. Seriously. It was Lemon Curd with Macadamia Brittle and a Pink Peppercorn Meringue. First of all…salty and sweet. Second of all…LEMON!! This was a fantastic and light dessert. And I wanted to devour it quickly because it was so delicious…but I managed to keep my sweet tooth under control and really savor each bite. The lemon flavor was spot on. Not too much. Just right. And the pink peppercorn meringue was fantastic. Light. Fluffy. Topped with the macadamia brittle that just tied everything together and gave it a crunch, which was needed in an otherwise soft dessert. This was love in dessert form. Lemon-y, nutty, meringue-y love. And I had to make sure I got a bit of everything in each bite. Rye really, really outdid themselves. Not only were we treated well from the start, but the food they served up was beyond anything I could have imagined. They were more than happy to work with and around my food allergies and dietary needs. Sitting at the chef’s counter was an amazing treat that was worth every bit of money we poured into that meal. This was more than a dinner out with my foodie friends…this was a foodie experience. If you haven’t checked out Rye yet…you should. Their menu sounds amazing and they are very good with dietary restrictions. Their kitchen is clean and kept that way. Their staff is knowledgeable. And I can’t wait to go back again and try some food off their standard menu. Thank you, Rye…for such a treat that night. This entry was posted in Cheese, Clean Eating, Dessert, Dressing, Drinks, Eggs, Entree, Food, Fruit, Gluten-Free, Local, Mushrooms, Nuts, Polenta, Restaurants, Review, Sauce, Soup, Spreads, Sweet Stuff, Vegetables, Vegetarian, Yogurt by The Celiathlete. Bookmark the permalink.